This week our final five bloggers will be presenting their posts in the Crafted Appliqué: New Possibilities Blog Hop. If you missed any of the previous stops, they are well worth going back to and visiting! We've seen so many fun, original, and beautiful ideas for using the fray-free, iron-on, washable Crafted Appliqué method and it's been a real treat! This week's posters have some exciting things in store for you too! The blog hop calendar is shown at the end of this post. You'll have a chance to win a free copy of "Crafted Appliqué: New Possibilities" at every stop! I'm also starting a new giveaway today, but first I want to show you another one of the projects in the book, so read on! Catmint is an herb that can be used in a tisane to help alleviate feminine complaints. Visiting your favorite quilt shop will also have this effect. One of the things I wanted to try to do with the Crafted Appliqué method was to build a little three dimensional quilt shop using architecture themed fabrics and then "plant" a garden around it. I did the garden by fussy cutting a floral fabric and layering the flower bunches into beds. As you can see, I was able to get quite detailed with my cut outs and I didn't have any trouble with fraying. I even made trellises and railings and window grilles. Can you find the tiny birdbath and a cardinal in the photos below? They are actually fashioned from flower and pot bits I found in the print. This was the first project I made for the book and the most challenging, but it was also a lot of fun. It is big enough to fit over my vintage Singer 301. If you wanted to make something larger or smaller, you could change the enlargement instructions for the pattern. I have been tempted with the idea of making a cat house. Can you imagine all the possibilities? Accuquilt Go! Baby Fabric Cutter Giveaway! an "Accuquilt Go! Baby" Starter Set. One of the exciting things that I learned about the Crafted Appliqué method of fabric preparation is that it works perfectly with die cutting! It's a really fun way to get lots of fray-free, iron-on, washable appliqué cutouts made quickly and uniformly. I love to use mine this way and thought you might like to see it in action. The photos below show a sequence of steps as I ran treated fabrics through the cutter. 2. BuzzinBumble followers, both new and old, can have a second chance to win by leaving a second comment and letting me know how they follow my blog. Everyone is welcome to enter the giveaway contest and I'm willing to ship internationally. Already, I've sent book giveaway wins to Sandra in Singapore and Helen in Ireland, which is pretty darn exciting! 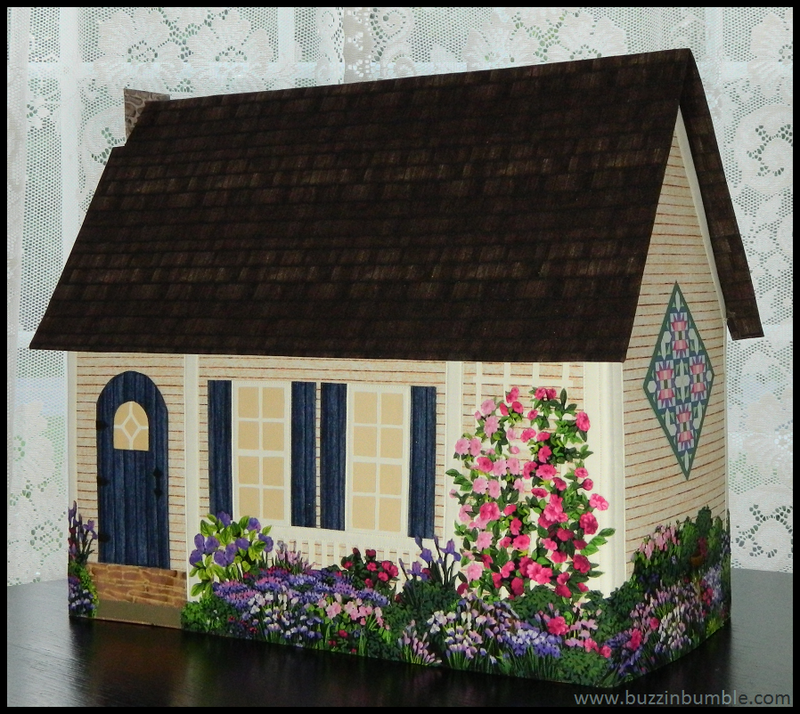 All the giveaways here on BuzzinBumble will run right up until the end of the Crafted Appliqué: New Possibilities Blog Hop. Winners will be randomly drawn on June 4th and I'll be announcing all the winners during the final post of the hop on June 5th. If you'd like to see the first four giveaway contests, there is still time to enter! Week One - Crafted Appliqué: New Possibilities Blog Hop - Giveaways Galore! Don't forget to visit the Crafted Appliqué Blog Hop Stops for a chance to win a copy of my book and possibly other prizes too! What if you can't wait to see if you won a book and you would like your own copy of "Crafted Appliqué" ASAP? There is no need to wait - you can purchase one now. If you do win, but have already purchased the book, I will gladly reimburse the cost of the book instead. In the meantime, you can purchase a signed copy here on BuzzinBumble, or buy one from the AQS shop, or through Amazon. On Sunday, June 5th, I'll be announcing the winners of all the giveaway prizes here on my blog. This will be where you can first find out if you were a lucky winner in one of the BuzzinBumble giveaways. Also in that post, as a way to say a very HUGE thanks to my blog hop participants, I'm going to turn the spotlight on them and I'll be running one last giveaway. I'm planning something special and hope that you all will like it and will take the opportunity to follow some very wonderful quilt bloggers, if you haven't already! Below is the Blog Hop Schedule. All the blog titles are live links, which I will keep updating as participants post their reviews. You can click on the pup to leave a comment. Best of luck! I think I like all of them so far. My applique is just so so, needs work. I will need to get your book and practice a lot. Wow, fussy cut flowers, birdbath complete with a wee red bird( we don't have them down here) and everyone who has hosted and posted on this, a wonderful selection of applique projects, they are all winners too. The Walking tree would have to be my favourite, and my batiks would suit all those tiny leaves so well ,and maybe use up lots of small pieces I cannot bear to throw away. A " Go Baby" would be the ultimate win. Lovely leaves cut perfectly. I follow you on blogger, as you are added to my side bar list of blog friends. I love the large daisy and the tree is just lovely too! Thanks!! I don't think I have a favorite project because they all look fun. BTW, this has been a fun hop. Hope it's getting you a lot of book sales. I follow via my Blogger Dashboard "Blogs I Follow" list. I also follow on Bloglovin' so I can read from my tablet. Love the quilts on the side of the house that you have on your sewing machine cover you've shown here and have enjoyed others on the blog hop. Got your book last night :) Can't wait to use your method. I have to test how it work with my own freezer paper technique. There are so many neat projects I've seen so far on this wonderful book blog hop. I think I'll choose the moth so far. Beautiful cottage! But my favorite so far has been the moth! Wow that is just adorable! Great work! I love this! So cute and creative. I still am not sure which is my favorite, though. Each week I think that is my favorite. 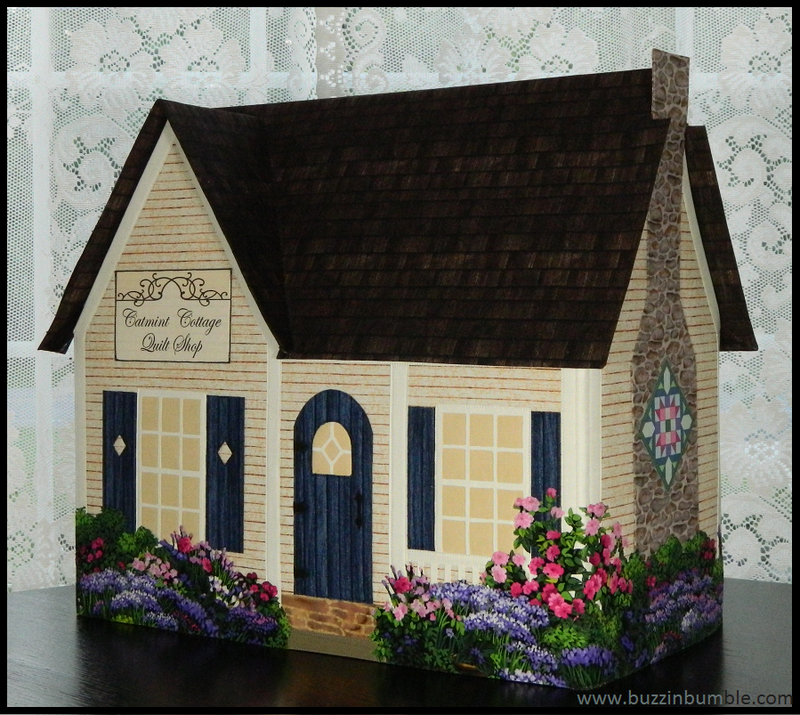 OHHH, that cottage is SO tempting ;) And after making the moth, I know that even though it might take some time, it would turn out spectacularly! I was just having a conversation with Wendy the other day and she mentioned using a cutter for her applique. How awesome that the perfect method of getting no fraying can be combined with perfect cutting!! I have never seen anything like this before! What an amazing cottage! The flowers are so pretty! I haven't a favorite project...they all look like so much fun! Oh my goodness! 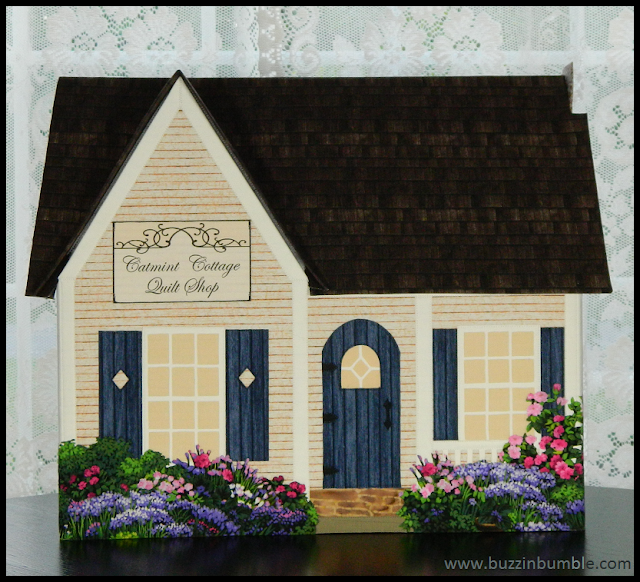 Catmint Cottage totally blows me away! Soooo neat! I love the sewing machine cover! So happy to hear this technique works with the accu-quilt machine. 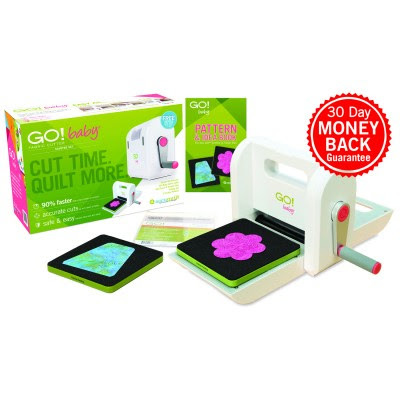 wonder if anyone has tried cutting with the Cricuit explore or a Silhouette machine yet? Love all the projects but the Catmint cottage is just awesome. Sam, I did use my Cricuit to cut of some smaller sized letters, the first two cuts were not so good, but the other 10 that I cut out worked great! i love your catnip cottage, i still think the moth is my favorite. can't wait to try this technique. i follow your blog on blog lovin'. I think it's a toss up between the cottage and the retro camper as my favorites in the book. 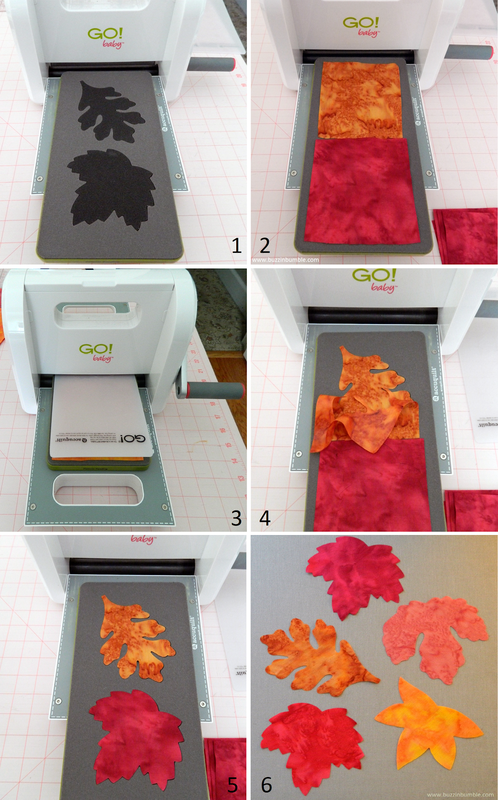 I don't have an Accuquilt cutter, but I can see how handy it would be to cut applique pieces. You know I love following you Lara via GFC. I love the retro camper! Sew adorable! I would follow you ANYHWERE, you know it. I am so happy that you have highlighted this project. It is my absolute favorite in the book. Your fabric choices and the detail are perfect. Of course, I am a follower of yours. Lara, since I've been away I've missed most of the excitement but I'm catching up little by little and having the best time. Your cottage is simply wonderful and you might even persuade me to try applique after all especially if I had a Go Baby cutter! Thanks for all you inspiration and I love the book. The retro camper is my favorite…too cute!!! Your Catmint Cottage gets a huge WOW!! !…love it!!! Love following BuzzinBumble so many great ideas! Lara, you've got to be over the moon with all the creative projects bloggers have come up with using your new technique! I have enjoyed following each one daily to see what could top the previous one! I'd have to say that my favorite project was made by Sandra at Musing of a Menopausal Melon. That gorgeous butterfly and the dog & cat pillow are both projects I want to try. I'm sad to see the blog end! Of course, I am a Bloglovin' stalker of yours! Best sewing machine cover ever and I love your idea of creating a cat house. Purrfect idea! Did you know that Lily Pad Quilting holds a Pets on Quilts Show every August? Could be a great time to show off your new design (no pressure). Love the cottage sewing machine cover - OMGosh it is so cute!!! I've never used a machine to cut out my pieces. What an incredible invention! This sewing machine cover is adorable but it must have taken hours and hours to do! Cool giveaway--thanks for the chance to win! I'm really anxious to try your new applique method. The more I see, the more excited I am to try your method! Oh how I would love to win any of the prizes that are being offered. They are all such fabulous giveaways! Thank You so much for sharing all that you have, like your husband I missed not seeing any posts for the Holiday and am going to miss all the links when the Blog Hop is over! Have a fantastic creative day! I do follow you by Bloglovin and by email! I do not want to miss any of your posts from now on! Great Blog Hop and a fantastic Blog! I every project I have seen from the book thus far. I think this cottage may be my most favorite. Or maybe the walking tree. No, the moth...sigh. Just one? They are all amazing. Casey Jones, my Singer 301, needs a cover. Maybe I can adapt the pattern to look like the old railroad station in the town where I grew up. I think I love this project best but there are a couple others running a close second/third. This little house is just the cutest project. Then I read that you use it as a sewing machine cover and then I was amazed. Wonderful is all I can say. What what a great idea for a sewing machine cover--and given the title of my blog, I should give it a go! I love the crisp look of it. I love the house patterns! I'm a very recent follower by email! I follow mostly on bloglovin' and Facebook. I think that this sewing machine cover is my favorite of the book, it is just awesome! I really like the Folk Art Christmas wall hanging! Thanks for another great giveaway. Your sewing machine cover is adorable, and I especially love the flowers! I am so interested in learning more about your method! Thanks for such a great giveaway! Your sewing machine cover is be far my favorite project. This has been a wonderful hop. Thanks. The projects that I've seen from the book and the bloggers have blown my mind, I couldn't possibly choose a favorite. I can envision so many things I could do once I learn how to do this new magical applique method. I think you've scored a home run with this book, congratulations! I love this little house, it could easily be my favorite)) But i'll still vote for the Christmas appliqué. Oh, now that little quilt shop is adorable!! Love all your details! I like the Folk Art Christmas wall hanging. I am a new follower. I follow you via Bloglovin'. Thank you so much for the chance to win. Shahann at yahoo dot com. I love the camper. IT's my favorite. Wowsers! The Catmint Cottage nearly made me fall off my chair. It is amazing! Love the sewing machine cover. Wow...it's amazing. I follow on Bloglovin and on Facebook. Since I have a camping trailer I have to pick that darling trailer in fabric. What a cute little machine, looks like total fun! Your Catmint Cottage is beautiful! 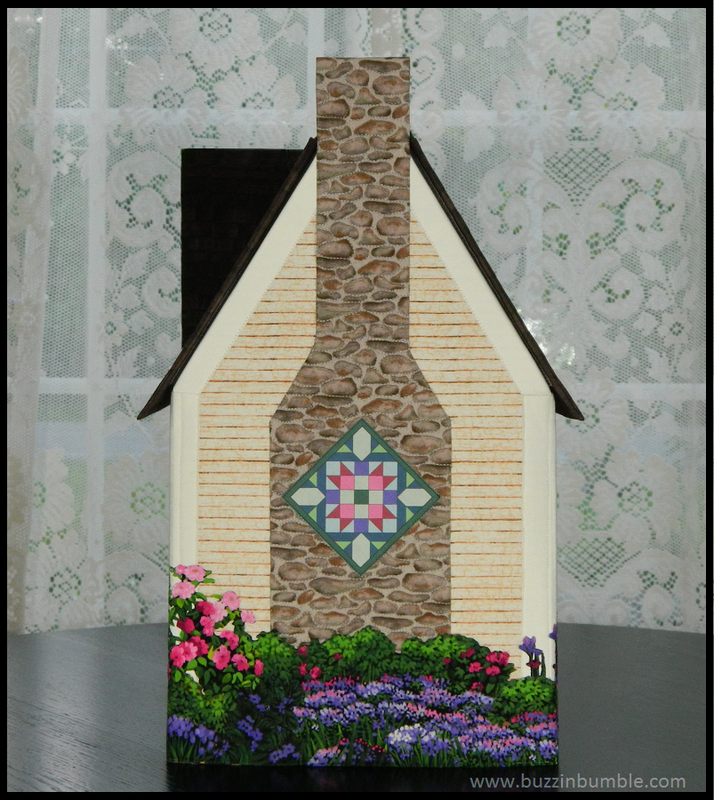 I love the fabric you used for the chimney and the addition of a barn quilt. This book looks like so much fun! I think this block project has become my new favorite! It's stunning! All of the projects are wonderful, but I like your house the best. It is awesome! Thanks! You have so many pretty projects in that book, it's really hard for me to pick a favourite! I LOVE the cottage. I was amazed by all the details you added. Incredible work! I would love to make that sewing machine cover. It would look so cute sitting on my table. I follow on Bloglovin as well. Your house is so beautiful Lara! The quilt on the side.....is it all little teeny tiny pieces? Awesome work! Don't enter me in the contest as I already have a AccuQuilt. I love all the projects in this book - but you already know that! I'm a huge fan! I'd love to win a Go! cutter for the quilt room at church - then I could bring mine home!!! Thanks for the chance! And I follow you on BlogLovin!! OMG!! What a fantastic give-away! I love your book but oh do love that retro camper!! I'm a fan and have your blog right on my sidebar blogroll under Quilty Friends so to never miss a post! I absolutely loove the camper on the cover of your book! So lovely! And I am drawn to the christmas tree, that looks really amazing. I am a follower via bloglovin'! Thanks so much for all the fun! It is so interesting to hop and read about your book. For sure : I need one, lol! I'm enjoying it so much and I'm not even a quilter (yet). The Catmint Cottage is so beautiful! 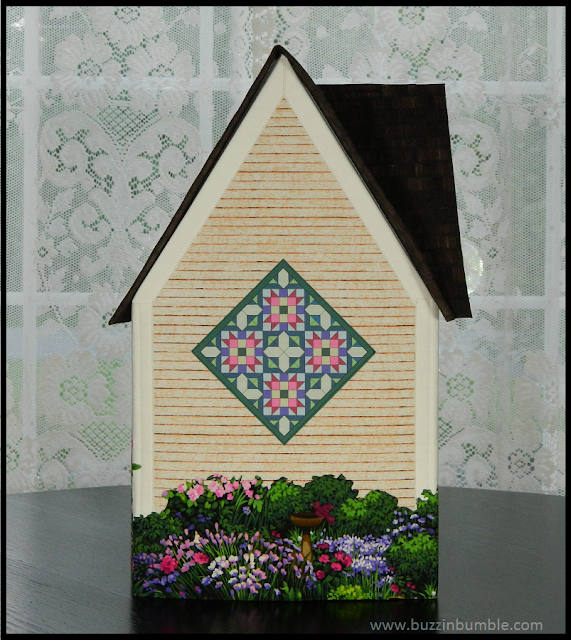 I am amazed with the tiny and intricate applique made possible by using the crafted applique method. Yes! A cat house would be so cool! The book looks great. Thanks for the giveaway and chance to win! Beautiful, great job of cutting, and I am interested in her method of applique. I love Catmint Cottage, only I would make it into a little wall quilt. Would love to win anything! Your sewing machine cover is awesome. And it would be awesome to wn that cutting system. Cutting is my least favorite aspect of sewing and quilting, so I know I would enjoy it. Thanks for sharing. I have enjoyed the hop so much. The Cottage sewing machine cover is awesome. It is so pretty. Thanks for offering the giveaway. I follow Buzzin Bumble via Bloglovin. I just love that camper! I did just find your blog and I am anxious to read about your applique technique. I'm following on Bloglovin. I love the sewing machine cover. I don't have a Go! Baby but would love to win one! Thanks for the opportunity. Excited to read about your applique technique! Would love to win a Go! Baby. Thanks for such a great opportunity! I just found your blog hop. The book sounds really interesting. I follow buzzinbumble on feebly. Thanks for the blog hop! Great ideas. I'm getting my first taste of the reviewers of your book. I like the simple flower pillow by Triangles and Squares. I would love to know what your secret method is! I always struggle with machine appliqué, and find needle turn the most successful. Of the projects in your book I like the Folk Art Christmas wall hanging most, although I could do with a cover for my machine, so I would definitely try making both. My applique is at best OK. I need to read your book so I get better. I know they say practice makes perfect but I am getting really old. Your house is amazing. I'm hoping I win your book. If not well I will start looking for it at my quilt shop. Congratulations on your great book; I would love to try out the new technique! I follow on bloglovin, facebook, and email. I would love to win the Go Baby to gift to a friend who has a tight budget for quilting. Over the weekend, I made cards using the Crafted Applique method using batikds and it is cued up to be in my blog this week. Will let you know the day! I just bought an Accuquilt Studio when it was on sale and need to cut some of my scraps on it!